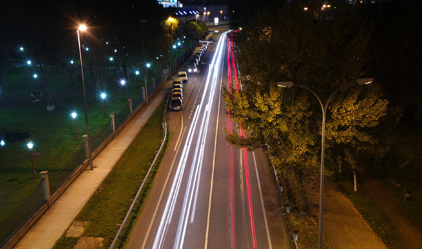 Big Research Question: How can street lighting make people feel safe as well as reducing energy demand and greenhouse gas emissions? Look up at the street lights in your area. Are they newer white lights or older sodium lights? This activity was inspired by the research that has led to changes in lighting across the country. Students consider how the colour of lighting impacts upon pedestrian's feelings of safety and how this links with facial recongition distances. This resource is based on the research paper: Raynham, P and Sakswikrønning. (2003) ‘White light and facial recognition’, The Lighting Journal 68 (1): 29-33. It is available here. Thank you to Peter Raynham for permission to use the diagrams, photographs and graphs. The research was funded by the Economic and Social Research Council. Peter Raynham is a senior lecturer at the University College London (UCL) Institute for Environmental Design and Engineering.